Several new ideas came into view in 2018, but few from the previous year have managed to jump the chasm to Early Majority adoption. Many organizations are embarking on “Digital Transformations”, often the same ones who have undergone two or three “Agile Transformations” in the past without seeing the promised benefits. We believe that this is because the adoption is often implemented “to pay lip-service” to the idea, and is shallow rather than truly transformational. Pragmatic approaches that mesh ideas from agile, DevOps, Machine Learning and Artificial Intelligence are appearing, and the methodology brand wars are diminishing. “Shift Left Security” is slowly becoming the norm – DevSecOps and variations are bringing compliance and security into the product team rather than seeing these as independent specializations. Organization and culture design continue to be two important pillars for achieving more effective outcomes. The new models such as Teal Organisations, Sociocracy (and S3), Holacracy are starting to gain more traction but still have a long way to go. 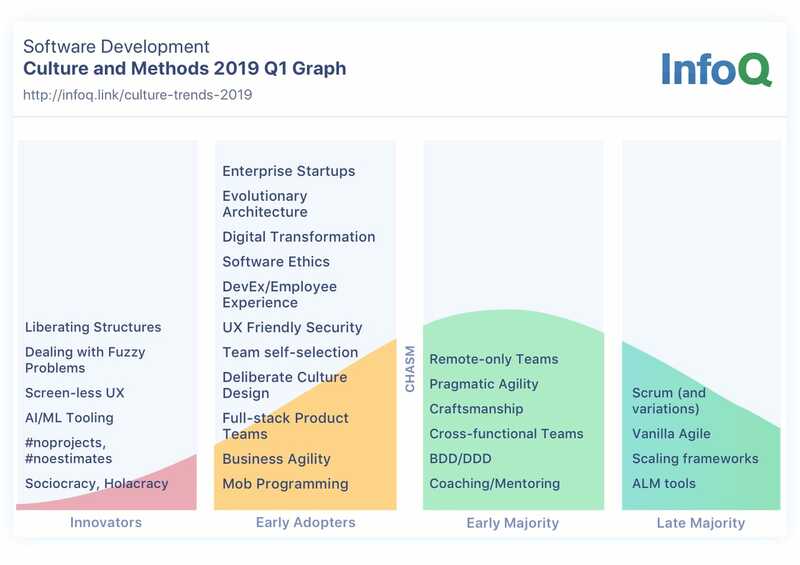 Every year at InfoQ we update our topic graph to show where we think different topics are in the technology adoption curve. When we do so we look at the state of practice, emerging ideas and information we hear on the various grapevines the editorial team is tapped into. If a topic is on the right-hand part of the graph, you will probably find lots of existing content on InfoQ about it – we covered it when it was new, and the lessons learned by the innovators and early adopters are available to help guide individuals, teams and organizations as they adopt these ideas and practices. The techniques and practices on the left-hand side are the ones we see as emerging now, being used by innovators and early adopters. We focus our reporting and content on bringing these ideas to our readers’ attention so that they can decide if they want to explore (some of) these now or wait to see how they unfold. There has been some movement of ideas from Innovator to Early Adopters, but none of the Early Adopter ideas from 2018 have jumped the chasm to Early Majority. Many of the organizational challenges which existed at the beginning of 2018 are still present, and they are slowing the adoption of innovator practices in the majority of organizations. We still see too much emphasis on changing the name of practices rather than genuinely changing organizational behavior and culture. For example, a daily status meeting where everyone accounts for every minute of their day to a project manager is not the Daily Standup prescribed in the Scrum Guide. It is only with cultural change that the promise of the new ways of working will be achieved. Many organizations are embarking on “Digital Transformation”, and it is often the same organization which has undergone two or three “Agile Transformations” in the past without seeing the promised benefits. We believe that this is because the adoption is often implemented to “pay lip-service” to the idea, and is shallow rather than truly transformational. According to the State of Agile report, agile software development has become a late majority approach; almost all software is now built using iterative and incremental approaches, and mainly using some derivation of Scrum or Kanban. The strong technical practices from eXtreme Programming are still the exception rather than the norm in early and late majority firms. As an industry, we may know how to build software better, but there isn’t the appetite to truly empower the teams and make the organisational changes needed to actually achieve the outcomes that Innovators have shown is possible. There are organizations who have achieved significant productivity, employee engagement, customer satisfaction and profitability improvements from adopting ideas, such as #NoProjects and DevEx, yet they still remain in the minority. Transformational change is hard. Acknowledging and accepting that there are fuzzy problems, which are hard to define and require completely different approaches to solving them is a really important starting point for changing the way organizations operate. The complexity and ambiguity in today’s marketplaces make it crucial to adopt new approaches, building on agile, DevOps practices and technical craftsmanship to reduce cycle times and feedback loops to minutes rather than hours or days. Liberating Structures provide a framework for working together in teams and organizations, they are explicitly designed to create safety and encourage innovation. Similar in concept to the Core Protocols, they are explicitly intended to grow humanistic cultures that enable high performance. UX + SecOps = UX Friendly Security: “Shift Left Security” and SecOps are coming together with user experience (UX) to enable product-accessible user experiences that make security less jarring. Some organizations are getting benefit from dual-track practices. Shift Left Security is becoming the norm – DevSecOps and variations are bringing compliance and security into the product team rather than approaching these as independent specializations. Artificial Intelligence (AI) and Machine Learning (ML) will start to impact development teams and their development practices; teams are using insights from data to drive estimates and select fit for purpose features to work on more than they have in the past. There are a number of tools starting to make this easier. However, AI and ML will also force teams to look at different ways to leverage Agile techniques as it can break many existing practices. The shift from project-based work to product lines (#noprojects) is starting to make inroads and is delivering value for innovators. DevEx and employee experience, in general, continues to be something that Innovators are exploring and applying, creating environments which reduce friction and enable people to be their most effective and most honest selves. Practices such as Mob Programming and Mob Testing are becoming more accepted, and the social aspects of technical work are being recognized as important for technical success. In addition to the ethical considerations, diversity is a source of competitive advantage, and diverse teams achieve better outcomes. Organisation and culture design continue to be two important pillars for achieving more effective outcomes. The new models such as Teal Organisations, Sociocracy (and S3), Holacracy are starting to gain more traction, but still, have a long way to go. Along with this, there are moves towards shorter, more effective working hours in a few organizations. Some organizations are enabling Enterprise Innovation through spinning-off new disruptive Start-Ups as a survival strategy. These 'lean'-startups have the advantage of a large parent to draw skills from and easy funding, and allow a safe ground for disruption. With the rapid pace of change, Evolutionary Architecture is absolutely necessary for success, and implementing such an architecture often necessitates a cultural as well as a technical change. We hope that ethics is something that has always mattered, and 2018 certainly saw questions about software ethics be much more frequently asked. Business Agility is a topic which has gained traction as more and more organizations realize that they are actually in the software industry, irrespective of what products and services they produce. Fully Fullstack Product Teams: T/π-shaped product creators have all the skills needed to go from product inception to deployment and support. Teams transition from technical teams to complete end-to-end product teams which have business knowledge, marketing expertise, technical development, UX, design, support competencies and any other skills needed to bring a product to market, respond to customer feedback and maintain it. Ben Linders is an Independent Consultant in Agile, Lean, Quality and Continuous Improvement, based in The Netherlands. Author of Getting Value out of Agile Retrospectives, Waardevolle Agile Retrospectives, What Drives Quality, The Agile Self-assessment Game and Continuous Improvement. As an adviser, coach and trainer he helps organizations by deploying effective software development and management practices. He focuses on continuous improvement, collaboration and communication, and professional development, to deliver business value to customers. Ben is an active member of networks on Agile, Lean and Quality, and a frequent speaker and writer. He shares his experience in a bilingual blog (Dutch and English) and as an editor for Agile at InfoQ. Follow him on Twitter: @BenLinders. Craig Smith has been a software developer for over 15 years, specializing in a large number of technologies in that time. He has been an Agile practitioner for over 10 years, is a Certified Scrum Master and Certified ICAgile Professional and a member of both the Scrum Alliance and Agile Alliance and currently works as an Agile Coach, fulfilling technical lead, iteration manager and Agile coaching roles on technology and business projects. He has presented at many international conferences and is a reviewer of a number of Agile and software development books. In his spare time, Craig is an avid motorsport fan. Shaaron A Alvares is a News Reporter and Editor for DevOps, Culture and Methods at InfoQ and works as an Agile Transformation Coach and Trainer at T-Mobile. She is Certified Agile Leadership, Certified Agile Coach from the International Consortium for Agile, and Agile Certified Practitioner, with global work experience in technology and organizational transformation. She introduced lean agile product and software development practices within various global Fortune 500 companies in Europe, such as BNP-Paribas, NYSE-Euronext, ALCOA Inc. and has led significant lean agile and DevOps practice adoptions and transformations at Amazon.com, Expedia, Microsoft, T-Mobile. Shaaron published her MPhil and PhD theses with the French National Center for Scientific Research (CNRS). Rafiq Gemmail is currently Technical Lead with Bank of New Zealand. He is a passionate advocate for mob programming, having supported cross-functional teams through over a year mob programming at New Zealand's largest news site. He shared his learnings on this at JSCon NZ in 2017. Raf is also a champion for DevOps culture and one of the organizers of New Zealand's DevOps days. He is also an ICAgile certified coach. Charles Humble took over as editor-in-chief at InfoQ.com in March 2014, guiding our content creation including news, articles, books, video presentations and interviews. Prior to taking on the full-time role at InfoQ, Charles led our Java coverage and was CTO for PRPi Consulting, a renumeration research firm that was acquired by PwC in July 2012. For PRPi he had overall responsibility for the development of all the custom software used within the company. He has worked in enterprise software for around 20 years as a developer, architect and development manager. In his spare time, he writes music as 1/3 of London-based ambient techno group Twofish, whose debut album came out in February 2014 after 14 years of messing about with expensive toys, and spends as much time as he can with his wife and young family.